To create a giraffe, we will need favorite threads and a hook. 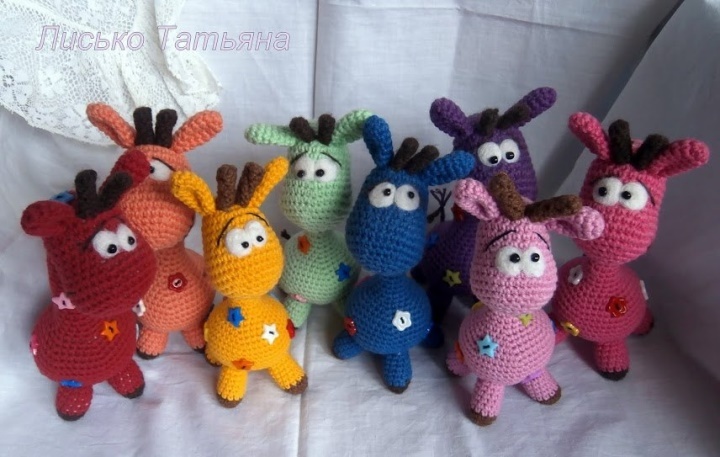 I will knit with Jeans with orange color and a little bit of brown for hooves and horns. With a hook of 2.5 mm. I’ll fill the holofiber. For the neck, I use a wire (you can without it, just fill your neck tightly) 13-15 cm. For the peephole there is wool for felting white color and 2 small beads. For specks 10-13 buttons ( I will be asterisks). 15p. (3xV) * 3  Fill the neck with a bit of filler. If you do without a wire, fill tightly. 31p. (4xA) * 6  Insert the wire. I have 15 cm. The advantage of the wire in the toy: you can change the turn and tilt of the head, change the bend of the neck, etc. Bend to tilt the head and make a loop at the base of the neck. We fold the ears in half and connect the edges. We try on and sew ears and horns on the head of a giraffe. I do not throw out the tips of the threads from the horns, but tie them to the tail: 7: We braid the tail with a pigtail. I roll my eyes and sew beads on my pupils. You can cut out the protein for the peepholes from felt or knit, which is more convenient and accessible for you. We sew on the body spots. I have buttons-stars. You can tie or cut out of felt circles, flowers, hearts ... that you like more. IIIII ... EVERYTHING !!!! READY !!! !